CLGTC Compulsory team is made up of levels 3, 4, and 5. Every compulsory gymnast in the United States does the same routine that has been developed by the United States Association of Gymnastics (USAG). The routines stress the basics of gymnastics and give the building blocks to work higher level skills in years to come. Our compulsory gymnasts train between 13 and 16 hours per week all year long and attend approximately 8 meets per year. CLGTC Optional team is made up of levels 6, 7, 8, 9, and 10. 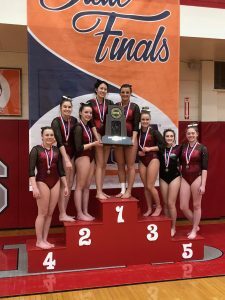 Optional gymnasts make up their own routines on all 4 events, but still must follow strict guidelines. Our optional gymnasts train 20 hours per week all year long and attend approximately 7 meets per year. CLGTC Xcel team is made up of Silver, Gold, Platinum and Diamond. USAG developed the Xcel program as a more laid back, less stringent and demanding version of competitive gymnastics. Girls who want to play soccer, cheer, dance, etc. should consider this program. Xcel gymnasts get to make up their own routines, while following certain guidelines. Our Xcel gymnasts train between 6 and 16 hours per week all year long and attend approximately 4 meets per year. The Crystal Lake High School team that is made up of students from Prairie Ridge HS, Central HS, Cary Grove HS, and South HS trains at CLGTC. They have won High School State multiple times in the past several years. Prairie Ridge was 2nd in State 2017-18.